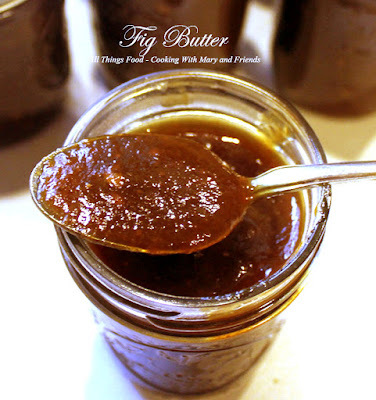 So, if you can make Apple Butter then why not Fig Butter? I'll have to admit after looking for some recipes for Fig Butter, they are virtually nonexistent. Oh, sure, there are a few out there, but not the many I expected to find. Well, that led me on a mission to make my own. The results are this creamy, luscious, "full of fig" flavor butter. Be warned! This stuff is addictive! Also, it takes awhile to cook down and thicken, just as Apple Butter does. How do you use it? Spread it between layers on a cake, use it in fruit pasties, top it on thumbprint cookies, slather it on your toast, biscuit or English Muffin. It's delicious! Place figs in a large stock pot (no need to chop, or stem). Cover stock pot and cook over med-high heat, stirring from time to time to prevent sticking. Cook until figs are very soft. Process figs through a food mill, or use the "vegetable and fruit" strainer attachment on your electric mixer. The result is the fig "pulp" which will resemble very thin applesauce. Return processed figs to the stock pot, and add the sugars, molasses, and all the spices except the orange zest. Cook uncovered over a low heat several hours, stirring from time to time to prevent sticking (this may take up to 3 hours). Eventually you will notice the fig butter thickening. Once it is thickened to your liking, remove from heat and allow to cool a bit. Process all the fig butter in a blender or food processor until smooth. Return to stock pot, add orange zest if desired, and continue to cook down over low heat about 1 hour. Ladle hot fig butter into half-pint jelly jars and process in a boiling water bath 10 minutes. Remove jars and allow to cool undisturbed on your kitchen counter 24 hours. Store in pantry. Apples! Apples! and more Apples!